This is post is from last Halloween, but the information is still very relevant for today. We hope everyone has a safe and happy Halloween! For many kids with food allergies, Halloween can be extra frightening. Finding safe treats to enjoy can be challenging for children– chocolate, eggs, nuts, soy, and wheat are commonly found in Halloween treats – but they’re also common, and in some cases, life-threatening, food allergens. So what is a child with food allergies to do? Sit out from trick-or-treating? That’s no fun. Many children still dress up, but understand that they will need to give many, or all, of their unsafe treats away. This year, there’s a different option. The Food Allergy Research & Education organization launched the Teal Pumpkin Project to encourage communities to start a new tradition by providing non-food options for trick-or treaters. Want to participate? 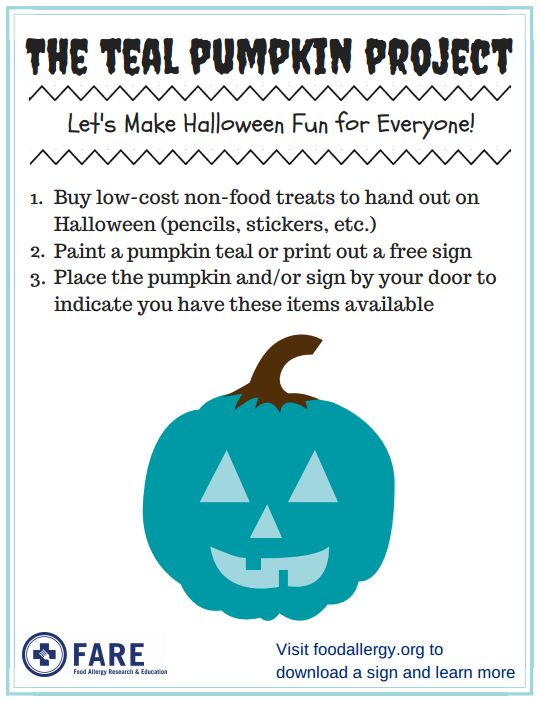 Simply paint a pumpkin teal (the color of food allergy awareness) and place it on your porch. You can also print out a sign to indicate that your house has non-food treats available. Not sure what kind of non-food treats to provide? These items don’t have to be elaborate or expensive. Think glow sticks, bubbles, bouncy balls, noisemakers, or stickers. You could get a pack of typical birthday party goodies from a party store or you could visit the dollar section in a super store. Taking a few extra minutes to participate in the Teal Pumpkin Project will help keep Halloween a fun, positive experience for all. For more information on the Teal Pumpkin Project, visit http://bit.ly/1vkzbDj. Win a VIP Patriots Game Day Experience!